To learn about the arrangement of the elements on the Periodic Table, and to review the idea of valence. As they play, the students will notice certain patterns, such as the fact that all the elements with similar valencies are in the same column. The game board is, of course, a giant Periodic Table. 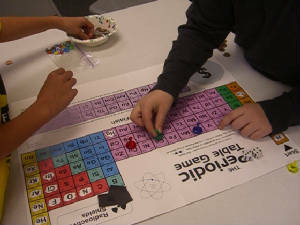 Players use dice and tokens to move across the board following the atomic numbers. They receive or lose pennies according to the positive and negative valency number listed on each element. Extra pennies can be earned for landing on gases and liquids, or being able to tell who or what that element is named after. (An information sheet with the origins of the names is available for study before the game starts.) If a player lands on a radioactive element they must put safety shields on the spaces before and after them. The game is over when some reaches the end, but the player with the most cash wins.